English actor Idris Elba keeps himself busy. 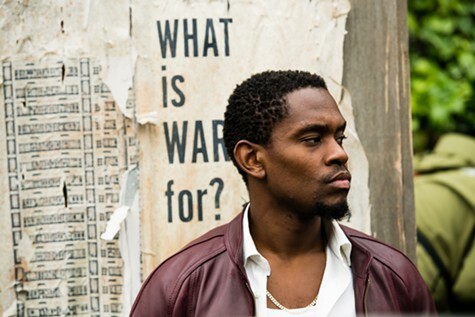 In between his TV work (Luther; In the Long Run) and appearances in such feature films as American Gangster, Mandela: Long Walk to Freedom; Beasts of No Nation; and The Mountain Between Us, the London native has maintained a separate career as a DJ, under the name Big Driis the Londoner. Maybe that’s why the plot of Yardie appealed to him. His U.K.-produced, self-directed crime actioner – screenplay by Brock Norman Brock and Martin Stellman, based on a novel by Victor Headley – spins its old-fashioned good-kid-done-wrong plot as the story of a music-loving young Jamaican who needs to make a lot of money in a hurry. D (played by British actor Aml Ameen) grows up on the island amid incessant Kingston gang warfare, but all he really wants to do is create the ultimate sound system for his beloved dancehall reggae beats. Someone or something always gets in the way – either King Fox the local record producer and cocaine dealer (Sheldon Shepherd, gnawing the scenery) or Rico Grimes (Stephen Graham), the pompous powder lord of the East London borough of Hackney. D arrives in London as a drug mule, hot on the heels of his true love Yvonne (Shantol Jackson) and their young daughter. Everything he does in the dope business, in and around the Green Lanes neighborhood of North London, happens to a dancehall rhythm. No big message, no stylish camera tricks, just a regular immigrant gangster yarn, and not a particularly fascinating one at that. Elba the performer is a remarkable presence (he does not act in this one), but Elba the filmmaker needs to find a reliable script doctor and stick to him like guava jelly. Nice local touches on the streets of Black London. Suitable shoot-em-up-beat-em-up entanglements. Iffy acting and occasionally feeble dialogue. Better luck next time.